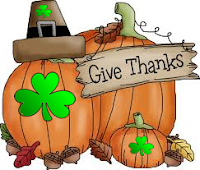 Surviving Ireland: "No, Victoria, They Do Not Celebrate Thanksgiving in Ireland." "No, Victoria, They Do Not Celebrate Thanksgiving in Ireland." "No, Victoria. They do not celebrate Thanksgiving in Ireland." This is my oft-quoted response to many of my American friends who are convinced the entire world celebrates Thanksgiving. But they don't. Particularly in Ireland. Thanksgiving is an uniquely North American affair- a day of gratitude born from the sweat of a new nation. Yet many Americans - and Canadians too in that both countries celebrate their own holiday - continue to believe Thanksgiving is marked globally. Yet despite the distance, this day-of-days continues to be one of my favorites. And as an immigrant gone now for over 35 years, it is one that I miss most deeply. I miss it for its (usual) simplicity; for its lack of commercialization that has hijacked other holidays such as Christmas; because it is a day of family - of overeating, over-loving, and perhaps too many football games. In my posts I have often remarked that the life of an immigrant can be a daunting one. If you're thinking of uprooting your life, do remember that you'll be leaving behind many of the threads that form your cultural tapestry. Thanksgiving is only one of them. Yet here in Ireland, far from my nation's shores, I find that re-creating this day - while not completely satisfactory - can be done. In fact, many American immigrants I know work hard to celebrate Thanksgiving as they would back home. Yes, the Irish raise Turkeys. Lots of 'em. Which means getting your hands on a large feathered friend is quite easy. Stuffing might be a bit different - some ingredients you treasure may not be readily available here. But we do have bread here, and sage and thyme, and the good ingredients that make up the basics for great turkey dressing so who's to know the difference except you? Yes you can get Yams here. But never ask for a Yam. In Ireland they're known as Sweet Potatoes and they're abundantly available. The country is, of course, also chock-full of Spuds so basic carbohydrates to fill a Thanksgiving (Irish style) dinner plate will never be a problem. And yes, they sell cranberry sauce in many stores (cranberry is loved by Irish folk at Christmas time and it's usually in-stock by the fourth week of November). Appropriate pies can be a bit of a problem. Libby's Pumpkin Pie filling is not easily available (though some specialist shops stock them in Dublin). But apple pie can suffice just as well, if not better, and we've piles and piles of cooking apples available in store. And yet - some elements of the holiday can be sorely lacking. No, you won't see the Macy's Thanksgiving Parade (NBC, which broadcasts the Parade, simply is not available at least not as part of my Sky Cable package). While you can catch parts of it over the Internet, NBC does not stream it in its entirety in real time on this side of the pond, and even if you try to access it, you can't for legal reasons. (There's a work-around if you use certain secure IP infrastructure but often it's a pain). No, you won't be able to see your favorite football games, though you may catch highlights a few days later, and well after you've digested your turkey. But most importantly: no, your North American relatives and friends will not, in all probability, be paying a visit (unless they've chosen to fly in especially for the day). This can be a source of great sadness because after all, Thanksgiving is about family. You can, of course, fly over to see them. But it's not exactly like climbing into your erstwhile Jalopy to go visit Grandma a few hours away. Distance can bring heartache to immigrants, particularly on a day like Thanksgiving. And yet: the American immigrants I know in Ireland - including yours truly - do our level best to keep the day. Most of us, anyway. We do so because, no matter how long we've been in Ireland, we are at heart still American or Canadian. We do it because we treasure the memories of years gone by when we were 'midst loved ones in our own countries. We do it to keep this tradition alive, and we do our best to hand it down to our Irish-American kids and grandkids. So no, Victoria. Ireland does not celebrate Thanksgiving. But on the fourth Thursday of November, tucked away in cities, towns, and villages country-wide, you'll find those that do. And they celebrate the day with the same sense of thankfulness and gratitude that those in North America do. And perhaps our celebration resonates on an even deeper level. Because like the original Pilgrims, we too are recent immigrants. We too have had to discover new ways to survive. We too are thankful that we've somehow managed to safely make the crossing. After all, Thanksgiving was originally celebrated by immigrants as a way of expressing gratitude for life in a new country. In Ireland, those of us who are immigrants do the very same thing.